Note: This article was originally posted November 21, 2005. "Eradicate Youth Ministry As We Know It"
Read more about "Eradicate Youth Ministry As We Know It"
America’s Helping Youth . . . Is Your Church? 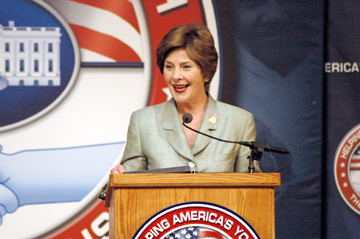 On Friday, August 4, 2006, Laura Bush, the First Lady of the United States, visited the University of Denver to deliver remarks at the second regional conference on Helping America’s Youth. SharperIron was honored to receive full media access to the event as part of the White House Press Pool for the day. Read more about America’s Helping Youth . . . Is Your Church? Mark Rivers ponders youth ministry’s user friendly tendencies.